Are Bean Bags Better than Cheap Outdoor Furniture? There’s an old saying, “Nothing cheap is good & nothing good is cheap”. Cheap is a word that usually describes a product of inferior quality. However, our modern outdoor furniture is not just inexpensive; it is also good quality! There are many factors to consider when searching for cheap outdoor furniture. While price is one of the most critical factors, convenience, quality aesthetic-appeal and longevity are also important. Modern sun lounges are manufactured from plastic, steel, aluminium, or timber. Plastic looks cheap; it may become brittle, crack, and is not practical inside your home. Aluminium, timber, and steel lounges are usually heavy and have a limited lifespan. Too often they fall apart; nuts come off bolts, hinges break, or the frame rusts. Steel and aluminium tend to get hot in the sun which may cause discomfort. Timber requires regular maintenance, with prolonged exposure to direct sunlight causing deterioration to the paint or varnish. These types of patio and lawn lounges are not even comfortable. And when it comes time to move house, they are difficult to carry and to transport. Our outdoor bean bags are the most enjoyable way to relax in the comfort of the great outdoors. They are easy to move because they are light, and they don’t have to stay outdoors. Because they look so good, they will add colour and style to indoor living rooms as well. Unlike conventional furniture, you can add or subtract filling to create a comfort level to suit your size and weight. Conventional outdoor furniture cannot be easily customised, which means whatever kind you buy is all that you will have unless you purchase extra padding or cushions. This only adds to the overall cost. Modern outdoor living rooms have become a favourite place to watch television and socialise with friends. The most comfortable way to sit when watching TV is in a bean bag. Many people think of a bean bag as a flimsy cotton or velour cover that can be purchased at a major department store like K-Mart or Target. Perhaps you’re unaware of the exciting possibilities our bean bags offer. You will love the quality, as these products feature heavy-duty stitching, zippers, and a separate inner liner. Your backyard, patio, deck, or pool surrounds can become bright, happy, and colourful. And when you’ve finished using them outdoors, all you need to do is pick them up and carry them inside. And unlike other types of seating, you don’t have to paint them, they will never rust, and the fabric will never fade even if you leave it out in the sun! Our outdoor bean bag range includes chairs for adults and kids. The most popular chairs are the ‘Freaky Cousin’ and the ‘Big Boppa’. For younger children, ‘Billy the Kid’ is the most popular model. The Lazy Bro doubles as a chair and a lounge, so you can sit up to read a book or chat with friends, or even lie down and chill out after a long day. The beanbag lounge range includes the Malibu Day bed and the Relax Sis. 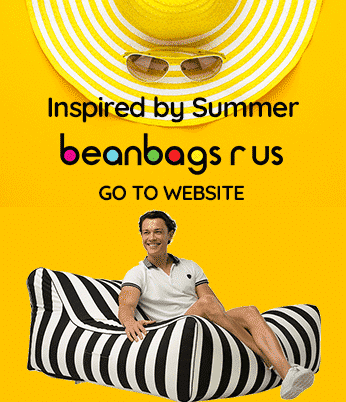 The Big Mama is a large beanbag which is also available with straps. The entire range of outdoor products is made with a very heavy-duty, 1680D Polyester fabric with a special Oxford coating that is soft, luxurious, waterproof, and fade resistant. Because of their high durability and sturdy build, these are without a doubt the best choice for any environment, whether it’s snow, rain, heat or a calm fall evening. And how about a day bed that doubles as a pool float? Throw any other day bed and your swimming pool, and it will probably destroy it. Our King Kong pool beanbags are equally at home in the water as they are on the ground. They can handle being wet, muddy, or even out in the sun and need little more than a rinse off to be good as new! 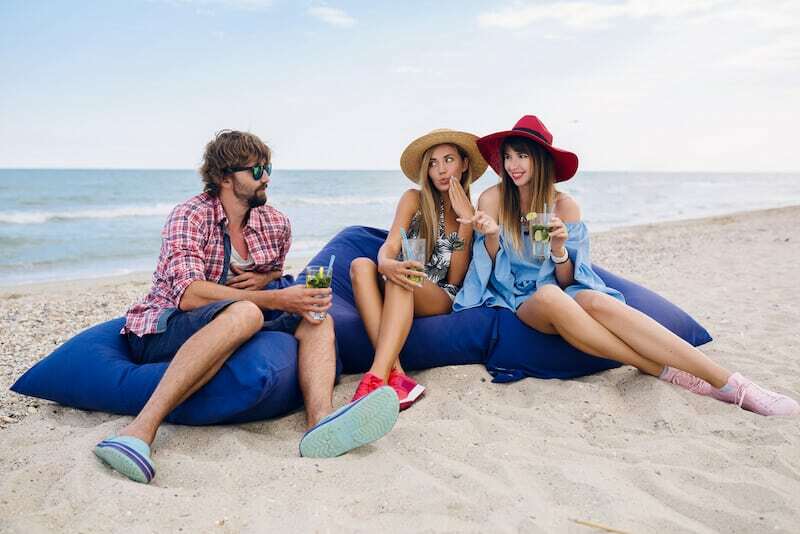 With some day beds costing hundreds or even thousands of dollars, our huge outdoor beanbags provide superior comfort without the considerable cost. We aim to provide cheap furniture for the outdoors for everyone!